What Will Inspire You in 2019? As spring approaches, you might realize that we are already well into 2019. As fast as time passes, you know that to achieve your goals it’s important to stay motivated. If you plan on redecorating, remodeling, or updating your home for 2019, it’s time to act. 2019 is a fantastic year for new trends, designs, and styles. With so many exciting and up-to-date options, you’ll enjoy giving your entire home, or even just a room or two, a makeover. From minimalism to boho chic, there’s interior design inspiration for everyone in 2019. As you dream and plan about redecorating your home this year, consider utilizing the professionals at Omorfia Designs. At Omorfia, we strive to bring beauty to every living space. With expert ideas and concepts, we can help you enhance your home decor and style. We offer exceptional service to all of our clients and exceed their expectations with every project. If you need some interior design inspiration, we can help you create the perfect space. If you’re ready to tackle some new ideas for your home in 2019, you’ll love these fantastic suggestions. Spring is the perfect time to start something fresh and update your space. You’ll find inspiration that will carry over into every season of the year. Take a look and start the home makeover right away. One of the latest trends for 2019 is minimalist design. This aesthetic is refreshing as it helps create peace of mind as well as order in your home. The minimalist look is modern and edgy. You’ll appreciate the open space and lack of clutter this look provides. Easy to keep styled and tidy, this design is perfect for 2019. Minimalism is a fantastic way to maintain order in your life and avoid stress. The open and airy space allows for comfort and relaxation. No longer will you be overwhelmed with finding a home for knick-knacks, or struggle to decorate. The minimalist look is simple, yet bold. Minimalism doesn’t mean you can’t have any personalized design elements. Use a bold color on an accent wall or with your furniture to show your style. The relaxed, laid back design of boho chic adds an element of charm to your living space. From vintage-looking furniture to colorful throw pillows and rugs, you’ll love that this look is back in 2019. Your boho room will boast character and style with layered looks and warm colors. Quite the opposite from the minimalist design, boho is about interesting decor pieces and unique touches. The design pieces in your boho space should all tell a story, and you can mix elements that are both modern and antique. This fun and fresh style allows you to let your personality shine and customize your space. You’ll have a blast selecting decor and bringing out your wild-child side for this unique aesthetic. Another unique and eclectic style is the postmodern look. A far cry from minimalism, and reminiscent of boho chic, postmodern combines varying style elements to create a bright and bold space. Retro colors like burnt orange and avocado green make a comeback with this funky and edgy style. Bold colors for accent walls, quirky furniture, and unique light fixtures all make for the perfect postmodern style. You’ll love the “anything goes” aspect of postmodernism, and have a blast choosing your playful decor. Does 2019 have you looking for something completely unique and dramatic for your home? You’ve seen accent walls, but how about statement ceilings? Statement ceilings add a pop of color or even pattern to your space. Whether you go with a bold, solid color, or use wallpaper to feature a geometric design, you’ll wow your guests with a statement ceiling. 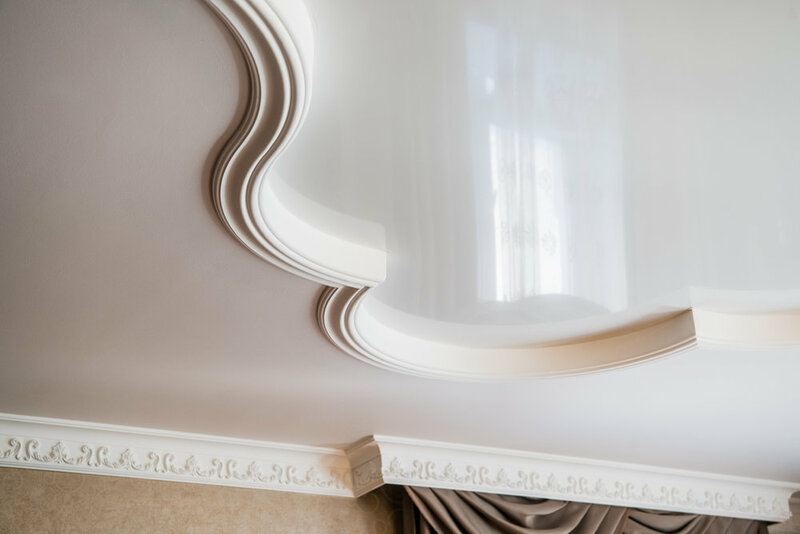 Your fresh, new ceiling can coordinate with other design elements in your room, or can stand out and grab your attention. 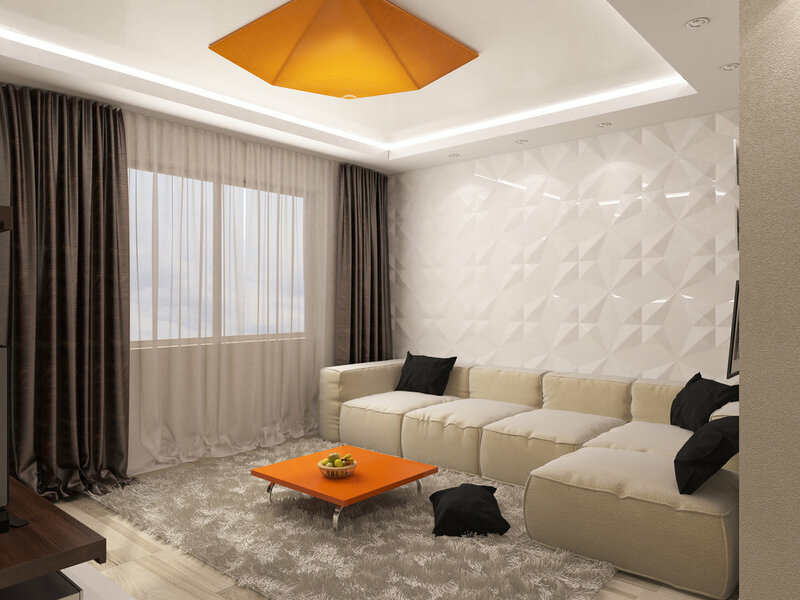 Your living space is sure to be original and exciting with a statement ceiling. From throw rugs to furniture to wall art, mixing and matching complementary patterns gives your home a warm feel. Inviting and unique, you’ll enjoy choosing the right pattern for your space. Each year, Pantone brings us the color of the year. The color of the year sets the tone for design inspiration. Pantone’s 2019 color of the year does not disappoint, with “Living Coral.” Living Coral is a vibrant coral shade with a golden undertone. Perfect for bringing your space to life and creating a warm look, you’ll love using the color of the year for interior design inspiration. Whether you choose to go big with an accent wall of living coral or implement it subtly in throw pillows, wall art, and furniture, you’ll have the most up-to-date living space of 2019. This trendy color will look fabulous all year long, and give your home a fresh touch. If these ideas provide inspiration, but you aren’t sure how to implement them, let Omorfia Designs help you update your home for 2019. At Omorfia, we can transform your living space into the modern, stylish room of your dreams. With expert style and experience, we will bring beauty to your project and help your home stand out amongst the rest. Start by chatting with us for your free thirty-minute phone consultation. We can help you envision an updated space that you will love. Whether you’re remodeling your kitchen, redecorating your office, or looking for a new and fresh style, we are ready with our ideas and expertise. Let us create the beautiful living space you’ve been dreaming about. Call us today to set up your consultation and complete your 2019 interior design goals. We are here to offer exceptional service and fabulous ideas. We look forward to working with you to create a modern and gorgeous space for 2019. Have a design question? Ask us!